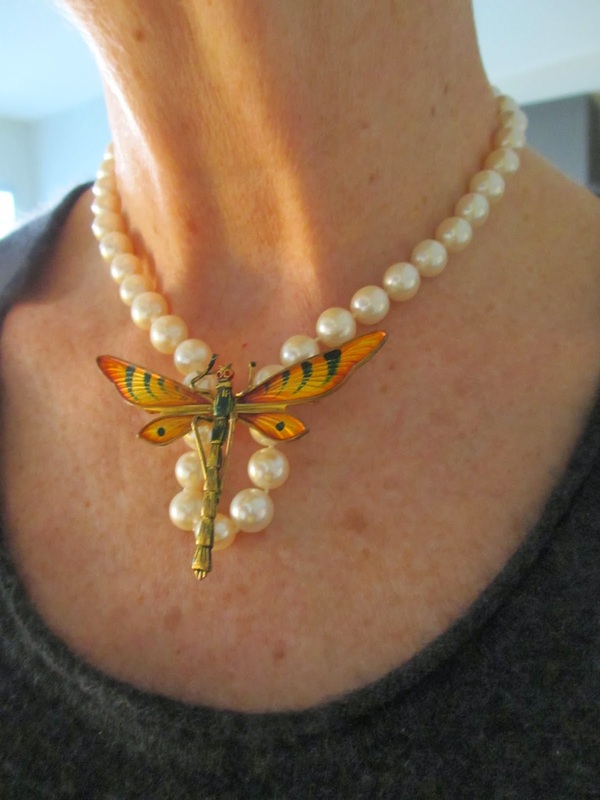 I thank the reader known as Murphy, who said, in a comment about my post about Christine Lagarde's pearls, "I have a simple strand of pearls, and I have not worn them lately because I think they make me look matronly." If you do not want to spend another dime, are indecisive about restyling, or made a vow to never touch Aunt Geraldine's pearls, here are five ideas that do not involve altering the strand. 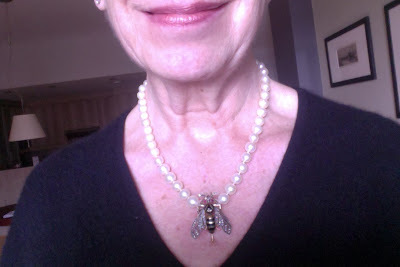 My most classic pearls: 10mm Chinese freshwaters bought 15 years ago from a beloved girlfriend who was a second-generation gem dealer and goddaughter of Harry Winston's, talk about pedigree. Sentiment has kept me from restyling them. So, how to wear classic, round whites so they're not matronly? I grabbed some shots to show you some easy options. Here, the "base pearls" with a two gold chains, a substantial link and a fine ball chain with pendant (Diane von Furstenberg for H. Stern). 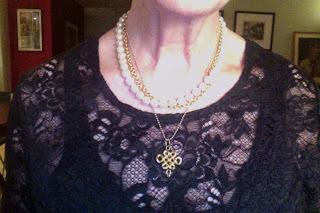 Worn with a French lace t-shirt; sometimes escaping matronly involves thinking of what's worn with the pearls. The pearls with an Edwardian coral necklace. Mixing any coloured beads with your whites leavens them. I like a smaller size, for the contrast and better drape; the pendant hangs below the pearls. I've pinned my mother's enameled dragonfly brooch to the strand. Most pearl enhancers are staid; they make the pearls even stiffer, like spraying the heck out of an outdated coiffure. You can find much more interesting options in the world of pins. To use a brooch as shown in the photo, the its clasp must be long enough, so that the bar of the clasp fits between the pearls (where the knots are) and fastens snugly. Check that the clasp closes securely, too, and have it replaced if not. You can also use a pin as a pendant; any pin with a vertical clasp will work. I tried an antique bee. You could also buy a pendant and use the pearls as the "chain"; for more examples, see this post. This is a felicitous route if your pearls are a small-sized, graduated strand. I tried the base pearls mixed with a long rope of faceted jet beads, and attached an Art Deco bar pin to three rows, at one side. The pin also looks good worn vertically at the center of the base pearls as a pendant. Hint: Put on the scarf first, then thread the pearls through. I liked this; a fun, light change. Maybe it will even improve my French! Now it's time (well, at least for me, it's 6 pm.) to have a nice restorative glass of wine, and feel deeply satisfied that those lightly-worn pearls got a day out. Please come back to the Passage on Thursday, for more ideas for the necklace everybody seems to own, but not wear. Fabulous ideas, Duchesse. I especially like the pairing with the jet beads. I vote for the pearls/scarf combo. I suppose that is because it seems new to me. Also feels like a new way to use a smallish scarf. I really liked the idea of using the brooches. It gives an entirely different flavour to the pearls. I like these combos very much. I've slipped a pendant onto my own simple strand, but never thought of using a pin, and I have several candidates for giving a new look. I'm also keen to try out the scarf combo . . . Don't suppose you feel like organizing a link-up? -- it would be fun to see your lessons executed by a range of your readers. Great ideas here. 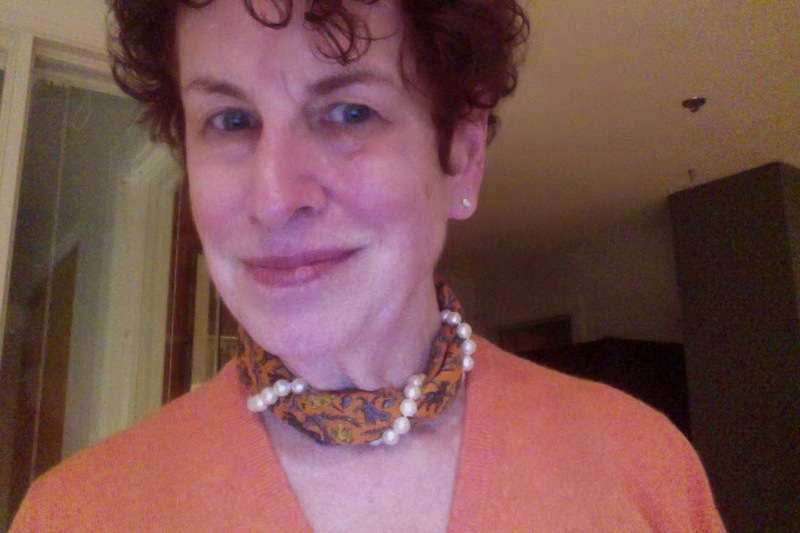 Hope my pearls are substantial enough for the scarf/pearl combo. I often wear my granny pearls with skinny jeans, a white button down shirt and the collar popped. Can't wait to see what else you come up with. Aww, thanks, Duchesse - you are the best! 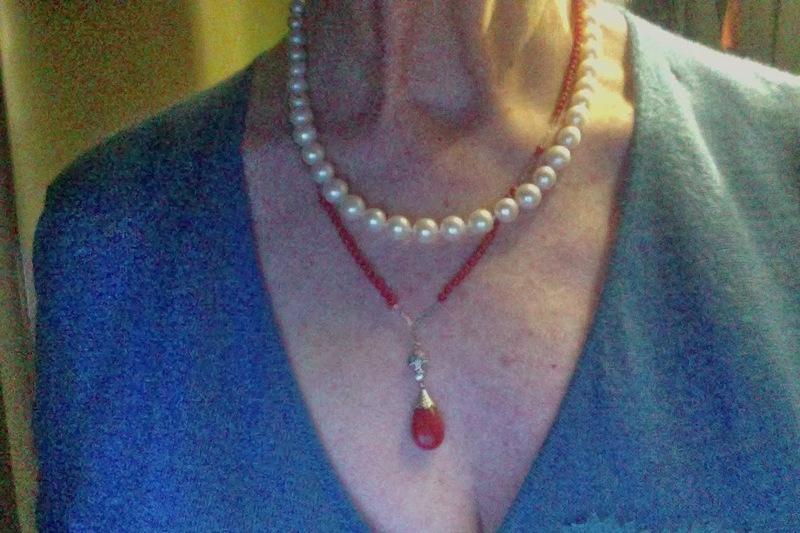 I haven't wanted to re-string the pearls because my generous husband got them for me at a charity auction and i'm afraid his feelings would be hurt. But these are great ideas - I' ve never thought of using a pin, and that pearl/dragonfly combo is fantastic! Lovely post!! I think there is an item that is intended to be specifically used when someone wraps a very long necklace around their neck so that it looks multi-stranded and keeps the strands from slipping (like you've done with your bar pin) - I can't remember the name of the item - would you know? Really really great post. The examples and photos are so helpful! I am going to try a few of these. I LOVE this post. I have several strands of pearls that i either bought or inherited and I am going to use all the ideas posted here. THANK YOU SO MUCH!!! une femme: I would add: those are Carolee beds, not expensive at all. seeyouthere: It's a pocket square, as small as you can get and still fit the neck. Mme: Yes and now I wish I had kept one or two costume pieces I gave to a charity sale! materfamilias: I feel like it but do not presently have the time. However, anyone who would like to send me a photo is most welcome to do so, and I can use in a later post. I'd appreciate that! Murphy: You're welcome, I really got into it. Sooner or later all pearls need to be re-strung as the thread breaks... so I am guessing you mean 'restyled'. But might a man understand the need to renovate every once in awhile? spacegeek and angiemanzi: Thanks, and I hope ou enjoy your pearls. It's good for them to be worn. 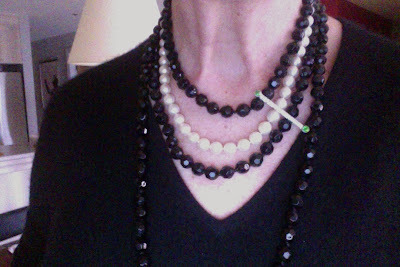 Oh I wear mine as you do with the coral beads, i.e., something else to provide a contrast. So naturally it's my favorite:). These are such interesting and fun suggestions - you've made me excited about my pearls! I will be trying the pearls twisted around the pochette. Lovely on you! I'm going to try numbers one and three - I have all the parts, just need to put them together. I've worn my big pink pearls from Kojima wrapped around a 90cm scarf. Will try to find the photo and send it. Must try the small pearls with my one pochette. Thank you for this most helpful post. Your jewelry posts are always fascinating. You have "the eye." Very nice. My mother in law left me a triple strand, very interesting pearls, old and not totally uniform. Any ideas when it's a more substantial mass of them? Rose AG: To respond to your request, I would like to see a photo and have mm size of pearls. Address is passagedesperlesATgmailDOTcom. I'm trying this today with a nice quality costume jewelry brooch: a leaping silver & hematite frog. I love the look and I love that it gives me the chance to break out (1) my grandmother's pearls and (2) some of the brooches I used to put on my jacket lapels. Two dated looks made fresh! I love the shape of the pearls created by the dragonfly pin! Is that the same strand in the next photo with the bumblebee pin? How long is the strand? Many terrific ideas here -- thanks. Linn: Would love to see that, the leaping frog sounds delightful! sisty: Same necklace used in all shots (and in tomorrow's post) that's why it's called "the base pearls". About 18 inches. I love the pairing of classic pearls with a colourful necklace (that coral is beautiful) and the faceted jet. Both contrast in texture/size as well is colour. Magic. Is size acceptance too generous?